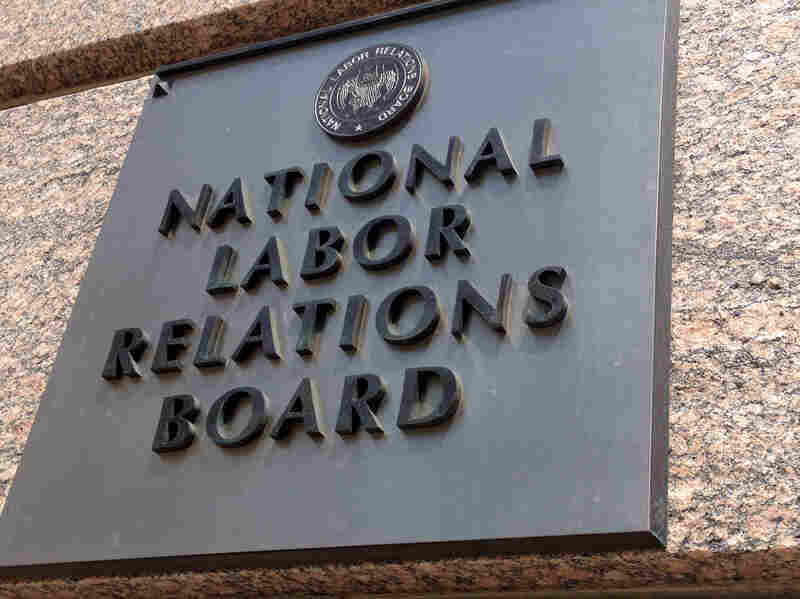 With Filibuster Deal, NLRB Could Soon Return To Full Force Since the 1930s, the National Labor Relations Board has served as the arbiter for squabbles between management and unions, or workers who wanted to join a union. In recent years, the board itself has become a battleground, but the agency could soon be fully staffed for the first time in a decade. The National Labor Relations Board building in downtown Washington. For decades after the 1930s, the National Labor Relations Board served as the arbiter for squabbles between management and unions, or workers who wanted to join a union. In more recent years, though, the board itself has become a battleground. Democratic appointees to the NLRB have grown increasingly sympathetic to organized labor, while Republican appointees have grown increasingly hostile, says Harley Shaiken, who studies labor relations as a professor at the University of California, Berkeley. "Management tends to in general prefer a far less active NLRB, where unions view it as essential for the future of the labor movement," he says. Shaiken says that antagonism extends to confirmation battles: Senate Republicans have repeatedly blocked President Obama's nominees to the board, making it hard to preserve the three-member quorum the NLRB needs to operate. "The NLRB has been limping under the Obama presidency simply because the president has been unable to get appointments onto the five-member NLRB board," Shaiken says. That could end as early as next week, after a Senate deal defused a standoff over Republican filibusters of executive-branch appointees. Last year, Obama used controversial "recess" appointments to fill vacant seats on the board, when the Senate was out of town, but not technically in recess. Several federal appeals courts have challenged that move, and the U.S. Supreme Court will consider the issue in its upcoming term. Those recess appointments became a crucial bargaining chip in this week's Senate negotiations over filibuster rules. Republicans agreed not to filibuster a series of presidential nominees, including the Labor secretary and the EPA administrator, both of whom were confirmed on Thursday. But in return they insisted the White House come up with two new nominees for the NLRB. "The NLRB nominations, I think, were at the heart of the deal to avert the so-called 'nuclear option' in the Senate," says Ilyse Schuman, an attorney who represents management in labor disputes. Larry Cohen, president of the Communications Workers of America, is disappointed that Obama had to withdraw his two recess nominees. But Cohen says he's perfectly happy with their replacements: Nancy Schiffer, who has been a lawyer for the AFL-CIO and the United Auto Workers, and Kent Hirozawa, chief counsel to the NLRB. Cohen says he thinks they'll be just as favorable for organized labor as were the previous nominees: Sharon Block and Richard Griffin. "There's no difference, in terms of their skills, their background, their commitment, their values," says Cohen. "There's no difference." Schuman agrees the new NLRB board members will be equally pro-labor, and without the handicap of a legally dubious recess appointment. "With this cloud of uncertainty removed from the authority of the board, it is going to return full speed ahead, if not even faster, on implementing, I think, enormous changes to labor-management relations," Schuman says. Schuman says the NLRB could now make it easier for workers to organize a union, something the Obama administration has tried but failed to do legislatively. "In the face of the legislative logjam ... there are other avenues — administrative avenues — that are being turned to to try to achieve those same objectives. ... Trying to seek ways to facilitate union organizing and increase the sort of record low numbers of union membership." Shaiken says Republican senators did come out of the week with a pair of political scalps. "The Republicans won a symbolic victory in that the president's two initial nominees were withdrawn. But the Democrats won a substantive victory in that the two new nominees — very highly regarded, quite qualified — will be Democratic nominees on the NLRB," he says. If the deal holds together and the new nominees are confirmed in the coming days, the NLRB will be fully staffed with five Senate-approved members for the first time in a decade.